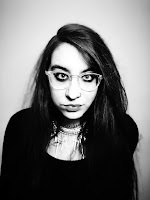 Forever Lost in Literature: Blog Tour: Wicked Saints by Emily A. Duncan -- Review + Q&A! 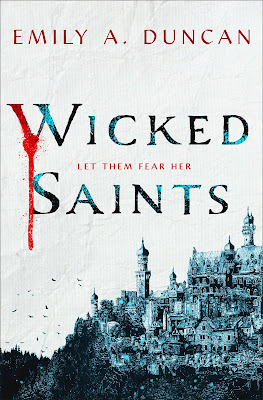 Blog Tour: Wicked Saints by Emily A. Duncan -- Review + Q&A! I am so thrilled to be part of the blog tour for the upcoming fantasy Wicked Saints by Emily A. Duncan! This book is dark, atmospheric, and full of twists and turns. 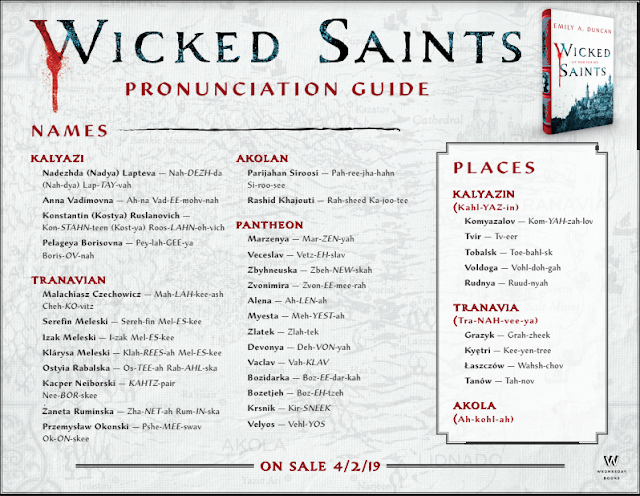 My tour post today features my brief review on the book, a Q&A featuring some questions that I was excited to ask Duncan, and an incredibly handy pronunciation guide (you'll definitely want to note it!). *Please note that some of the links used are affiliate links! 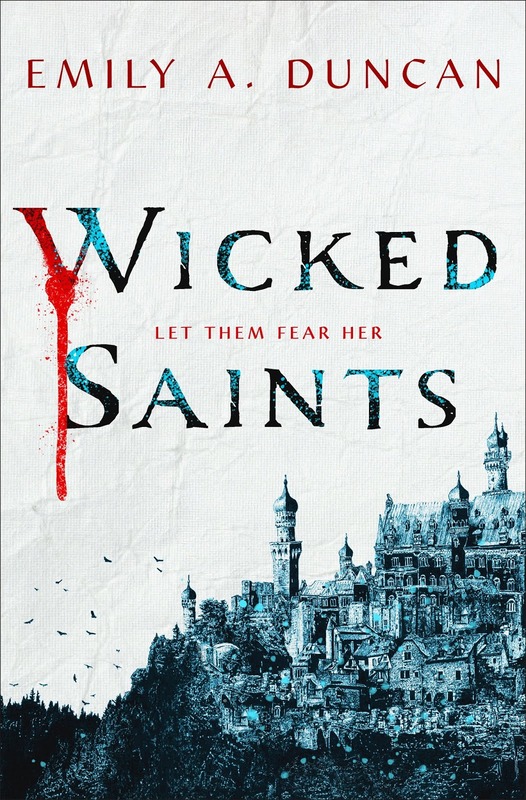 Wicked Saints is an intense, atmospheric fantasy novel with a dramatic setting and engaing plot. Duncan clearly loves to create characters with strong, unique personalities that all mesh well with one another. The world-building was equally exciting and unqie and felt very Russian-inspired, which is a setting that I am very much drawn to. I found the clash between magic and religion to be exceptionally thought-provoking and well done, especially when more philosophical questions regarding the two and how they can exist in the same world were discussed. I did have some mixed feelings about this book, however, as parts of this story were really well done, while a few others frustrated me. The pacing itself was a bit off to me at times and seemed to teeter between fast-paced with a lot happening and slow with almost nothing happening. There were also quite a few times when I felt lost, almost as if I had missed vital chunks of world-building, character development, or information about the magic system. There are some info-dump moments, but a few things still felt a bit confusing. Despite the minor issues I had, I still found this book a really exciting read and I'd definitely recommend it to anyone looking for a dark YA fantasy with an engaging plot with captivating villains and a beautiful setting. 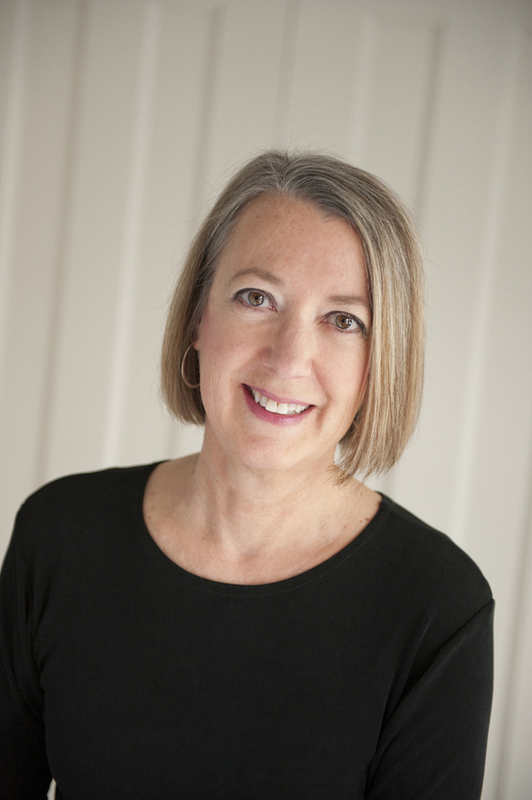 Q: I know a lot of authors see big changes in their stories regarding plot, characters, etc. throughout the process of writing--how did your own story evolve from the time you began writing it to the finished product? DUNCAN: The first draft only had Nadya, Rashid, and a handful of gods. It stalled out at about 30k words and I never finished it. The next draft had Nadya, Rashid, a handful of gods, and Serefin, Kacper and Ostyia. It stalled out at about 30k words. So did the one after that. Then, finally, I had figured out that it was that 30k point that was the problem and when I hit that point I threw in a bunch of new characters, hoping that one of them would have something to get me past that point I was constantly getting stuck at. I got, well, Malachiasz, and he sure did get me past that point and then make the entire book incredibly convoluted. The book now is very very different from where it was at the beginning, but the basic plot has actually always been the same. Q: Did you have to perform much research while writing Wicked Saints? How did you go about doing that? DUNCAN: I researched for years and then did simultaneous research while I was drafting. I was working at an academic library at the time, as a reference assistant, and my first love is doing research, so I did a lot of deep dives into databases. I also cleared out the greater northeast ohio area of their Russian and Polish folklore books. I had them all. They were all in my living room. Q: One thing that stood out to me was the character names, which felt very unique and Russian/Polish-influenced. Was there any particular way you went about choosing names and did you choose the names before writing the characters or did they seem to fall into place after establishing a character's personality? DUNCAN: I’ll tell you my dirty secret and it’s that I use name generators to name all of my characters. Nadya and Serefin’s names I came up with myself, but Malachiasz was a generator name and I still can’t believe it. I name characters first and the personality comes later but once a character’s name is set I cannot change it. Malachiasz was supposed to be a throwaway character, only in a few chapters, but then he stuck around. I wouldn’t have intentionally given a main character such an unwieldy name as his but that’s just how it ended up when he refused to leave the story. Everyone has a different process for naming characters, but the name generators work really well for me because I like seeing a lot of names all in one place and then picking which one feels right, and then digging into what those names mean/if they’ll actually fit the character afterward. Oh fantastic, I hope you enjoy it!